Cristina Tzintzun in her office at JOLT headquarters in Austin, Texas. Photo by Opheli Garcia Lawler. Ahead of the 2018 midterm elections, Latina women in Texas have been told they are powerful. They knew this, but now the media reports tell them this too. Candidates are knocking on doors they would have never previously approached. Data shows that Latinos in Texas could determine the outcome of the election. As races between Democrats and Republicans are closer than they’ve been in decades, progressive Latina women are claiming something owed to them in Texas politics: voice, agency and acknowledgment, and many hope that it will mean flipping the traditionally red state to blue. Austin is a hub for organizers who working to get out the progressive Latino vote across the state. Thirty-one percent of the eligible voters in the state are Latino, and by 2030, that number is expected to hit nearly 40 percent. But voting eligibility and voter turnout aren’t often the same thing. Women like Cristina Tzintzun know this. She is the founder of JOLT Texas, a progressive Latino voter organization that worked to register of thousands of Latinos to vote since November 2016. Now, she and her hundreds of volunteers have to get them to the polls. The Houston Chronicle reported that in Harris County, Texas, Democrats increased voter turnout with Latinos by nearly 300 percent, compared to a 50 percent increase by the GOP. Democrats have an approval rating of 49 percent, compared to 32 percent for the GOP from Latinos in Texas and other key battleground states, according to a poll released by NBC on November 5. “People feel like they’re a minority even when they’re in a state where people of color are the majority,” Tzintzun added. 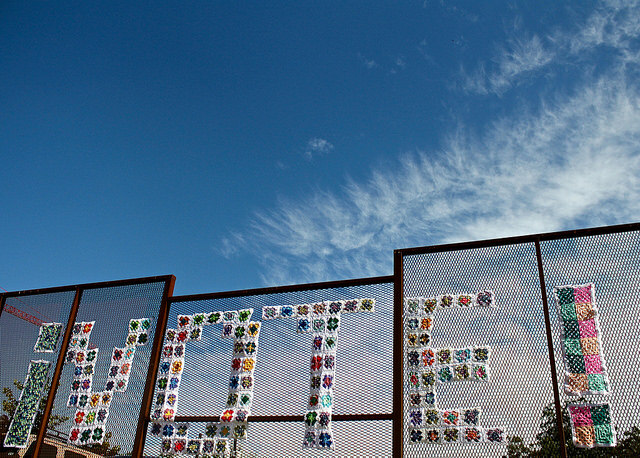 “¡Vote!” crocheted into a fence along a major highway in Austin, Texas, ahead of the 2018 midterms. October, 26,2018. Photo by Opheli Garcia Lawler. Some Latina women are those new voters that Tzintzun is talking about. Marciela Salazar is a social worker that lives outside of Austin. Her father is from Mexico, and her mother’s parents brought her mother across the border when she was young. This will be the first election Salazar votes in. Her parents never told her she was supposed to vote, and she never felt truly engaged by politicians. For a long time, she felt like she didn’t know enough to make an informed decision. She broke down in tears when recalling the moment she realized that her reason for not going to vote wasn’t stopping other people she knew, who voted for Republicans. Salazar’s friend Ana Zepeda is also a social worker. She is the daughter of Puerto Ricans, and since Donald Trump was elected president in 2016, she’s felt a constant anxiety – one that has pushed her to be more vocal about politics with her family and friends. 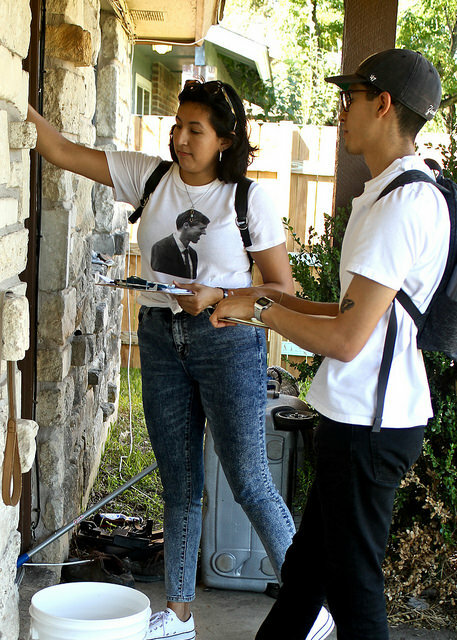 JOLT volunteers canvassing in Austin to encourage Latinos to get to the polls and vote early in the 2018 midterm elections. Photo by Opheli Garcia Lawler. An underlying theme among Latina women in Texas is how they are often the organizers in their communities. They consistently turn out to vote more than their male counterparts, according to a study completed by JOLT, with the exception of the 69+ age group. 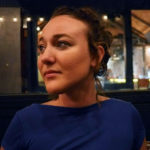 In Austin, they are on the ground organizing and canvassing, and working with civil engagement groups to reach people who’ve never been spoken to before. Maria Medina Miller, who is the Director of Diversity, Equity, and Inclusion for the League of Women Voters – Austin Area, feels the weight of her work. She explained that there’s a constant exhaustion of feeling under attack by an administration that has been vocal about their disdain of women, of Mexicans, of organizers, and she is all three. But that she doesn’t have the luxury of stopping.